Going from Salzburg towards the Salzkammergut, Lake Fuschlsee is the first lake you get to - and the clearest in the region. 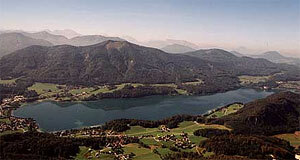 Ever since the 19th century, Lake Fuschlsee has been a popular spa and hiking holiday destination. Today, Fuschl (the only village directly by the lake) is a prosperous place. This is mainly due to two things: Fuschl doesn′t have a hotel, Fuschl IS a hotel. In fact, a cluster of many, many, many hotels. Needless to say, the village is a tad touristy during the summers. The second cash-cow of Fuschl is Red Bull - the company has its international headquarter by the shores of Lake Fuschlsee. But there are real attractions in Fuschl, too. The new lido, for example, with heated water to trick the famously bad weather of Salzburg. Lake Fuschlsee′s inviting shores are popular for hiking; it takes about four hours and offers many rewarding vistas on the surrounding mountains. In the many bays of Lake Fuschlsee, you can swim - many locals do so naked. This probably didn′t apply to the many celebrities that discovered Fuschl and surroundings as a retreat during the Salzburg Festival: Maria Callas, for example, who learnt how to snorkel here. Lake Fuschlsee′s water is so pure that it meets the high Austrian standards for drinking water (that is only if you go under a certain depth, since the surface is vulnerable to contamination due to algae and bird faeces). Fuschl also makes a good base for golf holidays, with some 12 golf courses within a distance of 18 kilometres. If you prefer hiking, try to climb Mount Schober; it is not an easy mountain and you should have proper shoes and some mountaineering experience, but the summit grants a great view deep into the Salzkammergut. Just outside Fuschl itself, behind the Red Bull headquarters, you can find the hiking route to Mount Filbling; this tour is much easier and on the way to a summit, you stop by a little lake, ideally placed for a refreshing swim. On the top of this mountain (which, by the way, belongs to the founder of Red Bull), you can also see much of the Salzkammergut and Fuschl from above. From some selected spots, you can even catch a glimpse at Schloss Fuschl Palace: Once a hunting chateaux first of the Prince Archbishops of Salzburg and later of the Habsburgs, it is now a luxury hotel and restaurant. Getting to Fuschl by car is very easy; it takes only a few minutes from Salzburg′s eastern edge. However, public transportation is less convenient. If you plan to stay in Fuschl, don′t be scared by that; many hotels have cars for rent and transfer services that are very reasonably priced or even included. Just ask at the hotel before you make your booking. Keep in mind that Fuschl is no sightseeing destination, nor particularly suitable for a younger audience - it is a quiet town good for spa-, golf- and hiking vacations, or very gentle skiing in the winter. For the latter, watch out for the skiing region of Gaissau-Hintersee.